Following two previous rejections of their application as being incomplete, the UCI has today confirmed that the RadioShack-Nissan team and GreenEdge squad will both be part of the WorldTour next season. It stated that documents submitted by GreenEdge on November 16th and RadioShack Nissan two days later have proven sufficient to advance both teams. The Luxembourg team has been given registration for the 2012 season, while GreenEdge has been given a WorldTour licence for 2012 and 2013, making it a ProTeam setup. RadioShack-Nissan has been formed after the previous RadioShack and Leopard Trek teams joined forces. The licence remains with the Luxembourg-based Leopard Trek setup, but RadioShack and Nissan have come on board as chief sponsors. A dozen riders have also moved across, meaning that competitors such as Andreas Klöden and Chris Horner will join up with Andy and Franck Schleck plus Fabian Cancellara, forming an extremely strong front. While Leopard Trek had previously been given a ProTeam licence until 2014, under UCI rules, every team with a licence must also satisfy an annual registration process. It essentially means that teams will be scrutinised every year, even if they have that long-term agreement with the UCI. GreenEdge was starting the process from the beginning and while it has only been given an initial two year licence, the news is still a major boost for the new squad. It becomes the first Australian ProTeam in the history of cycling, sealing the country’s place as one of the top forces in cycling. It comes just over a year after the Pegasus Racing team was turned down due to not having enough highly-ranked riders. The team subsequently unravelled, putting several riders out of the sport. The GreenEdge team will feature many strong riders in 2012, including Milan Sanremo winner Matt Goss, Simon Gerrans, Robbie McEwen, Jack Bobridge and Cameron Meyer. Today’s announcement means that there will be a full capacity of 18 ProTeams in the peloton in 2012. These will have automatic invitation to the sport’s top events, with Pro Continental teams needing invites to the same races. The UCI has stated that the final list of Pro Continental teams for next season will be published in one week’s time, on December 12th. Nissan to withdraw from RadioShack team? Could Schlecks be considering a move away from RadioShack? 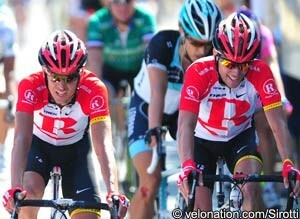 Could Bruyneel or the RadioShack team be excluded from the Tour?